We’re not sure if you’ve heard, but clowns are having a bit of moment right now. This thrills you, of course, as a lifetime lover of all things clownish. Now you can finally rest at ease this Halloween knowing for sure what society has finally proven: clowning never goes out of style. No one will second-guess the sighting of you in this cute and classic ensemble. Just step (or tumble, or somersault) into this Plus Size Giggles the Clown Costume and cram a bunch of pals into your coupe—ta-dah! You’re ready to head to the big party tonight. You’ve brushed up on your favorite jokes so you can crack the crowd up (your favorite) and you’ve been perfecting your pantomime. Lucky for you, one of your best pals is dressed like and elephant, so you can incorporate her into your act for the evening. And though we hope your party lacks a real lion to tame, you can always carry around a replica and act afraid of its ferocity. You’re proving with every move that clowns aren’t inherently scary! Brava! 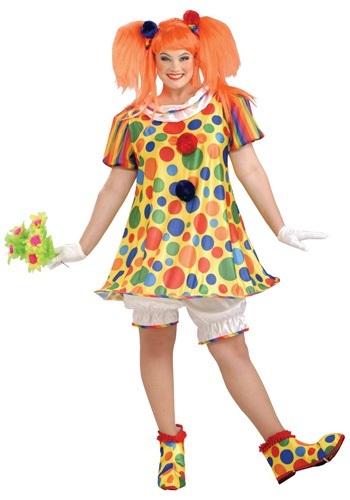 You may even incorporate this costume into your bit—maybe its rainbow polka dots remind you of gum balls and the bloomers allow for some top-notched tumbling. You made sure to top off your look with a red clown nose and a crazy colored wig, right? We’ll be sure to take a video of you hamming it up, so the folks in cyber land can see a real clown who isn’t afraid to take the age-old clowning craft seriously.